This year I have taken Tim Gunn as my style inspiration, formulating my sewing plans around Tim’s essential wardrobe items. 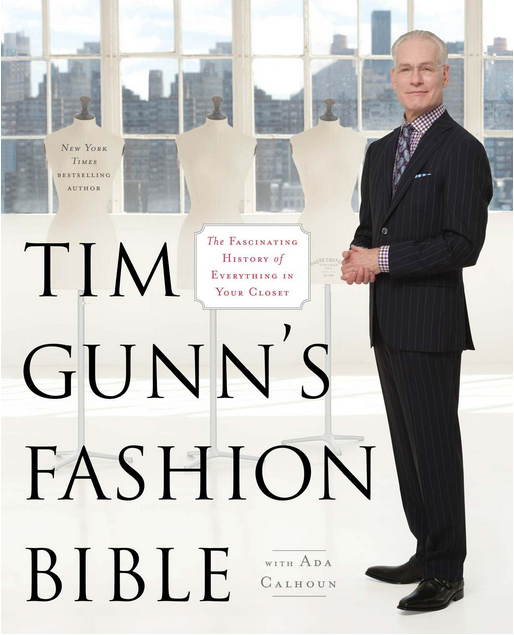 As such, I thought it would also be good to read the books Tim has written about fashion and style – A Guide to Quality, Taste, and Style and Gunn’s Golden Rules – and now his latest book, Tim Gunn’s Fashion Bible. I have to say I really enjoyed this book. I would have to say that of the three books Tim has written, this is by far the best. It is interesting and informative, but Tim’s voice still comes through and prevents this book from being a dry history of clothing. Though this book looks at fashion dating back to the ancient Greeks and Egyptians, the primary focus is on the rise of American fashion (and how WWII helped American designers become unique and innovative instead of just being European copycats), how fashion has evolved and changed through the decades, and how everything we wear today is really a derivative of history. I actually really liked the way this book was structured. I felt like focusing on the evolution of a specific type of garment gave a very cohesive feel to the chapters, although Tim’s writing style, as I have mentioned in my reviews of his previous books, can occasionally have a rambling feel to it. I do think that Tim’s passion for history, fashion, and education is evident in his writing though. One thing I did like about this book is that it focused on both women’s and men’s clothing history. While some chapters (like Dresses) focused more on women’s clothes and others (like Dress Shirts) were geared more towards men, I thought it was good and equally interesting to read about both. Another thing I really liked about this book is that there were side boxes full of useful information about modern clothing styles. For example, I now know the difference between hotpants, short-shorts, regular shorts, Bermuda shorts, culottes, gauchos, pedal-pushers, and capris. Yes, these are technically different and depend on subtle differences in length. There are also helpful tips about appropriate styles and situations for wearing clothes in the modern day. I have only one minor quibble – this book is not the best for bedtime reading – it is full of pictures and images from history, movies, and art which completely enhance the points made throughout the text, but also make the book a bit heavy and awkwardly shaped for cozy reading in bed. I think the great information and lovely glossy photos make up fot that though. Also, while I can’t really fault Tim for neglecting the history of home sewing (since, let’s face it, home seamstresses weren’t really creating fashion trends so much as following them), I found it to be a fun thought exercise to try and see how the history of home sewing as I know it works in the context of the information contained in this book. 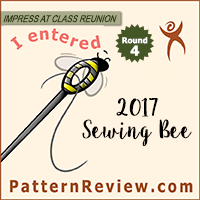 Tim emphasizes that fashion only makes sense in the context of history, and it is sort of easy to see how the cultural and societal revolutions in the 1960s and 1970s led to a wan in the popularity of home sewing. It is also sort of interesting to note how the drop in home sewing seems to have been part of the move towards dressing for comfort, obsession with branding, and throw-away clothing (which Tim does discuss in his book). I have to admit that I took little care or pride in my appearance before I started sewing, and while I know I have a ways to go (in terms of accessorizing, etc.) I have noticed a vast improvement in the way I look and feel. Partly it is pride from wearing my own creations, but part of it is also that thinking about making things has me think about wearing them and creating whole outfits. One of Tim’s gripes is that Americans have trended towards a sloppy unkempt look. 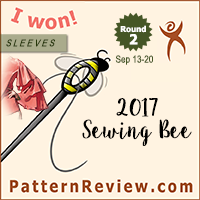 It seems like this is correlated with the trend away from home sewing. Coincidence? I think not. As Tim himself points out – nothing in fashion is coincidence. Another feature I liked about this book is that, though it focuses on the history of fashion, Tim also makes the reader think about how this actually applies to them and their modern wardrobe. In the Conclusion and Appendix, Tim (and co-author Ada Calhoun) encourage the reader to really assess their own wardrobe, what function it needs to serve, what sort of style they have (or want to have). I appreciate that while Tim is (very) critical of certain styles of clothing, he is still encouraging and sympathetic with his readership and admits that creating a functional wardrobe can be a bit daunting. I also like the fact that while Tim appreciates quality textiles and craftsmanship (most noticeable in his discussion of suits), he is still critical of unnecessary excess and expense (most noticeable in his discussion of handbags). He is very practical about fashion; it is clear he thinks that everyone should take care in appearance and try to cultivate a personal style, but he also feels that fashion needs to fit into a lifestyle and not dictate it. I rather enjoyed his discussion over the hypocritical notion that a woman is simultaneously criticized for not looking her best but also for wasting time thinking about the trivialities of appearance and fashion. * Tim hates 1980s fashion as much as I do! * Tim Gunn was at Woodstock?!?! * I don’t know if I am a Cleopatra or a Helen! The dress chapter and the comparison between draped (Helen of Troy) and structured clothes (Cleopatra of Egypt) was perhaps the most extensive but also the most interesting. My recent wrap dress is very much a Helen, but my LBD from the beginning of the year falls directly in Cleopatra territory. Seriously Tim, can’t I be both? * Tim disapproves of pleated pants. I tend to agree, as they are generally not a flattering style for me, but I am also planning on making some pleated Patrones pants soon. I am trying to expand my style horizons. It is an experiment, and failure is possible. But I think I am going to go for it anyway. Well, after I do a muslin first. * At some point I should make nice pajamas. Like seriously nice silk charmeuse pajamas and a sumptuous house robe. Up to now I haven’t had much interest in this area of my wardrobe, but Tim makes a few compelling points and so I am starting to think about the possibilities of nicer sleepwear. Not something I want to tackle right away, but, you know, eventually. After I deal with clothes that I need to wear out into the real world. * Tights – other than skating tights I don’t really have any. Since I haven’t worn many skirts or dresses in the past this hasn’t been a problem. Looking at my wardrobe going forward I think this might need to be remedied. But, like, real tights. Not pantyhose. Tim disapproves of pantyhose. * Apparently the white t-shirt is a signal for sexual availability – who knew? * Tim insists having one trench coat with a removable lining is enough coats for anyone (unless you live in seriously cold weather, which I don’t). I disagree, but that might have more to do with my love of making coats and tailoring than actual practicality. Although I now want to make a lightweight trench with removable lining sometime in the future. * If Tim Gunn is America’s style guru of today, Claire McCardell is Gunn’s style guru of yesteryear. Must keep a look out for more of her designs and books (now out of print). * I need to consider buying more options for accessories like belts and (maybe) hats and scarves. * George Bryan (Beau) Brummell (1778-1840) is my new style icon. Overall I would have to say that this is a fabulous book and I am so happy I read it. Clearly, it isn’t an exhaustive history of fashion, and probably wouldn’t be of interest to serious scholars or fashion historians. However, for those of us who are interested in a comprehensive, interesting, and fun overview of fashion history this is a great book. It is my favorite of Tim’s books so far, as it feel more informative that Guide to Style and more focused than Gunn’s Golden Rules. It is evident that despite all of the hats he wears, Tim Gunn is truly gifted as an educator, because he makes learning fun. I certainly have more appreciation for today’s fashions, and a greater interest in learning about fashions of the past. This was an enjoyable read and I highly recommend it to others. I love Tim Gunn's sense of fashion. He's a regular in Project Runway and I love how he helps aspiring designers in every challenge. Tim Gunn's fashion choices are also innovative and flexible. Thanks for the review! It is a book I didn't even know existed. Great review! I'm with Poppykettle on the pantyhose issue and on coats. A multi-season trench is the one to have if you can only have one, but why not have more? Coats really can make a statement. Your equation for the perfect number of coats is hilariously perfect for me. I have sort of realized that I need to plan out my sewing because otherwise I would just make coats and have nothing to wear under them. And, yeah, I was surprised on the anti-pantyhose sentiment myself. That's my feeling on the coats. If I wasn't sewing and wanted to invest in a high quality RTW wardrobe, I think the versatile trench makes sense. Since I can sew for myself, and I love how my skills improve when I work on something as complicated as a coat, and I have an obsession for coat patterns, well, restricting the coats in my closet isn't happening any time soon. In fact, I think most of my end of the year sewing is probably going to be dealing with outerwear. and I freakin' love cargo capri pants for the summer becuase then I don't need a purse! knife in one pocket, keys in another, money and id in another. voila, I'm ready to hike or sail or visit the street fair. Well, I have to admit that Tim made a concession on cargo capri's for activities like hiking or for construction workers or other jobs where need for utility overrides a need for fashion. I think his opposition is more based around the fact that people have started wearing them everywhere like out for fancy dinner and to business meetings and such. I think it stood out because while his tone in the other chapters was more informative and conversational, the chapter on capris and shorts felt like a rant and a lecture.